Boss is shaking his head as we prepare to descend into Horseshoe Canyon (also called Barrier Canyon), the deep cut in the earth behind him. There are only a couple of safe ways into this canyon. This one crosses through a part of Canyonlands National Park. National Park = no dogs. Poor Daisy had to stay in the trailer, where she whined and sometimes howled pitifully in protest. So sad. Much of the trail is sandstone. Above, paintbrush and a blue flower ( perhaps a form of mint called purple sage, but the photos are not good enough to confirm) grow in the cracks. We carefully avoided treading on the flowers. The rangers keep this dinosaur footprint, about 12 inches long, outlined for the tourists. The canyon also features several panels of rock art in the Barrier style. Above is a pictograph called "The Holy Ghost" panel, part of what's known as the Great Gallery. The anthropomorphic figures are life-size, and the design is unique. It was painted at least 4000 years ago by archaic hunter-gatherers. From the bottom of the canyon, we continued up the other side on an old roadbed built in the late 20's by the Phillips Petroleum Company hoping to make big money on a well. The road is crumbling and long since impassable to vehicles. Horses and hikers can easily follow the track. You can see the remains of a wooden derrick behind me and to the right. The well was a dry hole. ranchers used a lot of the wood and cable to build corrals or other structures. This low emission vehicle must also be 20's vintage. Alas, it wouldn't start. Maybe that was because a few of its parts have become displaced. From a high point of the Spur, the view goes on forever, or at least as far as the snow-capped LaSal Mountains, about 50 miles away. No civilization is apparent. This scene has remained unchanged for millenia. this post is absolutely amazing!!! maybe that old relic you're sitting in left the dinosaur track :D That is rough country but isn't the barrier reef panel something incredible to see? DEVE SER INCRÍVEL ESSE LUGAR. 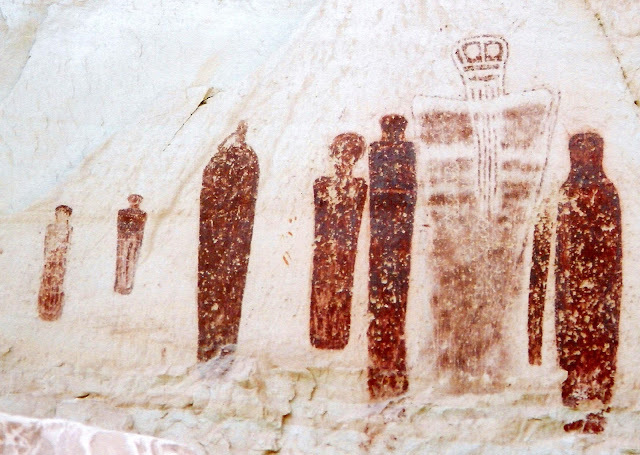 I find it amazing that pictographs go back so far. Time is concept I sometimes find difficult to fathom. Beautiful countryside to ride in! Absolutely stunning! It must be amazing to stand near art done so many ages past. And see the dinosaur footprint. I loved this post! That's a fixer upper, but $250 max should be able to get it back and running. And you can fuel it up from the nearby derrick. BTW: Love the dino print and also impressed how you obey NPS rules. Poor Daisy! I hope she got some extra attention when you got back. The dinosaur footprint is amazing, as is the artwork. I really like the panoramic view of your last photo. Poor Daisy... Think I heard her whining all the way to Tennessee!!!! The photo with the Indian Paintbrush in the rock is stunning! As for the purple flowers- it's too early to be a sage I think. I'd lay money on some sort of Penstemon- most of which are early to mid-spring bloomers. Wow, great post. I'm sure that some geologist somewhere is trying to still sell the prospect saying "The drilling engineer screwed up the hole." I was in an old wreck years ago and opened up the glove box and a field mouse popped out scaring the crap out of both of us. You guys saw lots of cool things on this ride. At least Daisy got to come and be with her people at night, better than staying home! Oh my goodness....so many interesting finds there. Love that old vehicle, but it will be hard to acquire a tag for it though.